Our operation hours are Mon – Sat 9 am to 5:30 pm. We are closed on most major holidays. 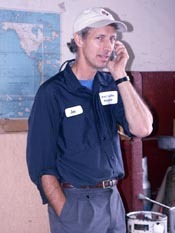 Jon Howe owns and operates West Seattle Recycling. He purchased the recycling center from Metrocenter YMCA in 1990, which started West Seattle Recycling in 1979. We moved to our current location in 1986. We currently have a staff of 12 persons - all active in buying, collecting and processing recyclable materials. Our mission is to provide the best customer service of any recycling center in the Puget Sound area. We strive to treat all our customers with respect and fairness, give honest weights and pay competitive prices. For our location, please get directions below. If you have alot of recyclables, please call us at 206 935-4255. Ask for Rob or Jon to negotiate a price for large quantities of recyclables or to set-up a collection program.